Marios Papadopoulos is the founder and music director of the Oxford Philharmonic Orchestra, Orchestra in Residence at the University of Oxford. Described by The Times at his 1975 piano recital debut as ‘having all the attributes of one of the world’s greatest players’, Papadopoulos has gone on to enjoy an international career both as pianist and conductor. He has appeared as soloist with and conducted many of the world’s great orchestras, and worked with a host of eminent musicians including Vladimir Ashkenazy, Hélène Grimaud, Anne-Sophie Mutter, Maxim Vengerov, Renée Fleming and Lang Lang. His recordings of the Beethoven sonatas have been set on a level with Schnabel, Brendel, Barenboim, and Wilhelm Kempff (Daily Telegraph, Classic FM Magazine Critics’ Choice). Papadopoulos has conducted the complete cycle of Beethoven symphonies and directed from the keyboard the five piano concertos in the Oxford Philharmonic’s 2008 Beethoven Festival, a feat he repeated again to celebrate the Orchestra’s 15th anniversary in the 2013-14 concert season. As part of the worldwide celebrations for Mozart’s 250th anniversary year, he directed from the keyboard the composer’s complete cycle of piano concertos with the Oxford Philharmonic Orchestra. In 2018, he will be undertaking a mini-cycle of the Mozart concertos in China with the Guangzhou Symphony Orchestra. Guest conducting and soloist appearances have included a 2015 UK tour with the London Philharmonic Orchestra and Alison Balsom, Philharmonia Orchestra & Chorus, European Union Chamber Orchestra, and the Royal Philharmonic Orchestra. In November 2018, he will be conducting a new production of the Marriage of Figaro at the Greek National Opera’s newly created opera house in Athens. 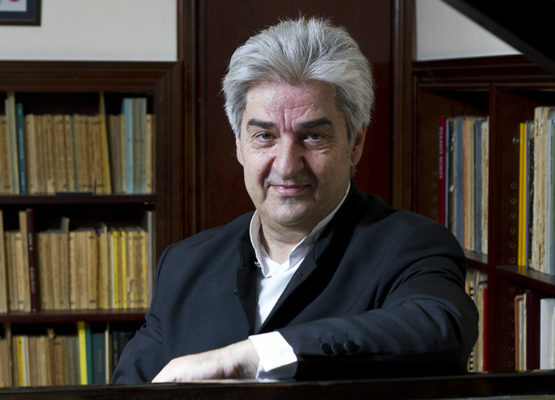 Papadopoulos is dedicated to nurturing young talent and through his vast experience is able to impart knowledge to young artists, particularly during the prestigious Oxford Piano Festival, which he founded in 1999. In 2015, he served on the jury of the Leeds International Piano Competition and, in 2016, the Weiniawski Violin Competition.